I can honestly say there were moments when I thought this quilt would never be done but I think I have most probably finished the piecing. Somewhere along the way I stopped taking photos of every version I rejected but suffice it to say I found the last few inches tricky. In the end I used entirely dark blue strips down at the bottom and a combination of leftovers pieced together and the dark green shot cotton to compensate for my shortage of fabric. Once the bottom was sorted out I added the dark blue strip on the left hand side, which sort of squares things up, but also felt right in terms of the balance of things. For the same reason (balance, not excessive wonkiness) I added one more row of across the top, echoing the darker blue at the bottom. And just like that I was satisfied and it was done! Next up I think I am going to do something nice and simple. The balance is just right in the end. It's a wonderful finish. It really looks like a map of city plots! Well worth the journey, I'd say! 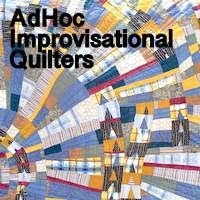 There is something about this quilt that really speaks to me. I think it is that fabric that looks like birch trees. It is saying come into the woods. I love it! Congratulations on the "done" status - this challenge has been much more challenging that the earlier ones. You met it well! The top turned out fabulous! I know it was a struggle, but you stuck to it and end up with a wonderful piece. Good job! Wonderful quilt in response to the challenge from Ann. The extra strips you've added does balance everything beautifully. Congratulations on the finish - what is the size now Kaja? You did it! Yay you! I really like the larger piecing units on the top and bottom. It sort of grounds the quilt. :) What a great quilt though. Definitely feeling the 'maps' vibes! I quite like the scale of your piecing and the colors you chose. The yellows sparkle against the blues. And those little bits of lavender quietly add a twinkle. The dark and light fabrics give excellent range to the values. I always enjoy watching you work in the smallest of your scraps in order to finish. Hooray for you. I love it! the balance is nice, just enough wonky, so, yes. Perfect. Wonderfully free and fabulous. It looks very manly. I really enjoy watching your progress vicariously. It's lovely. Pleasing to the eye. And let it rest for a while? I understand that. I really like it. I like the little squares in a row like film especially. Great choices, and congrats on coming to a conclusion. Nice job as always. Happy holidays my friend! Simple? Hahaha I can't believe it. This one is another great finish. There's not much to say that hasn't been said already, except add me to the list of impressed people. You just have a way of creating that the rest of us can only sit back and enjoy. In my case at least, there's no way to think it out like you do. I see you're still making fantastic quilts! I love all the plaids and the fun solution on the bottom left. You did it!! A most amazing finish, Kaja! Love all the beautiful detail in this quilt. All that to-ing and fro-ing has resulted in an exceptional quilt and dare I say it....perfect! I love it too, especially all the plaids! And have enjoyed following your posts as you made decisions. Anther fabulous finish! It looks great with the archway too. You have created a lovely map of many colors!